Home | daisy is crafty! | Recent knitting projects! Just when you thought I must be too busy with bathroom upgrades to knit, I bring you my recent knitting projects! First, flowers! 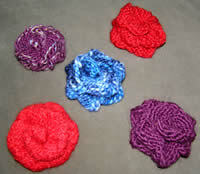 All made from wool, most with the same pattern… I like knitting flowers, they go really quick and you can do so much with them. 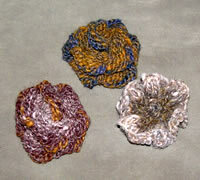 Embellish purses, put pin backs on them, just play with them! Then, purses! 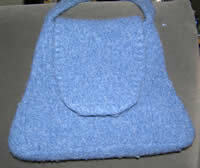 I LOVE knitting purses! The first, is a purse made from Noro Kureyon waiting for me to make a few more before I felt it. It is my own pattern, and I have no idea what it’s going to look like when it’s done, but I think it’s going to be beautiful. 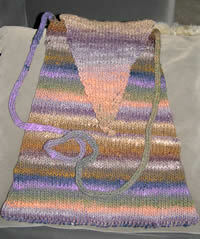 This is a purse made from Cascade 220, I also designed it. It came out exactally as I wanted it too. It has a small base so that it will sit on the table, and a cute rounded flap. I made the strap garter stitch rather than an iCord, because I really hate knitting iCords. I’m really pleased with it. A scarf for a friend… Well, she asked for a scarf for Christmas, and I knit one from Noro Silk Garden for her, but decided she needed two. This one is made from Crystal Palace Squiggle and R2 Fuzzy Felt. It’s really fun, and super soft. Finally, the hat from hell… made from some sock yarn, knitted on blinking size 2 needles. Let me ask you sock knitters out there, WHY? Why would anyone want to knit on size 2 needles. Whats worse, I read the packaging wrong. I started knitting on size 3 needles, and couldn’t figure out why the pattern wasn’t looking quite right… I read 2.5 – 3.0 mm as size 3. I know, stop laughing. Not a ton of thought process going on there that day. I also couldn’t figure out why the gauge was so off. Yeah. I figured it out, after I casted on and knit 3 inches, TWICE. I’ve got about 4 inches knit… The sides aren’t tall enough yet, and the guy I’m knitting it from has a head 25 inches around, so I’ve got another couple of days of working on it. I can say it’s going to be cute, but I’m not sure I’ll ever knit anything like it again. There are size 13 needles for a reason. People like me. Can you see why I’d like felting? Knit on really big needles, then shrink it to have stiches to look like you knitted on a size 2 needle. Makes much more sense to me! LOVE that little blue purse. I am thinking of trying my hand at designing a few (mostly just variations on the envelope style probably). I’m interested in seeing the striped purse after felting. Love, LOVE the purses! Believe it or not, I still haven’t managed to knit a single thing beyond a little swatch.